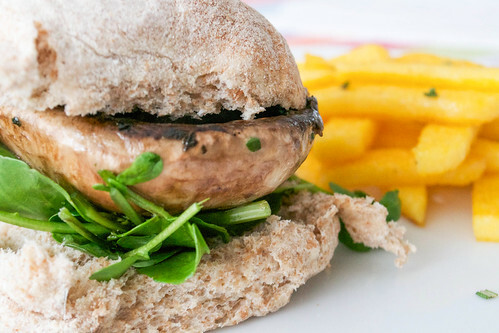 This is, basically, a mushroom sandwich. But it's absolutely gorgeous and makes a great change when you don't fancy beef or lamb in your burger. The thick, flat mushroom is unexpectedly meaty in texture, and when lightly pan-fried with garlic and parsley, it's ready in about 5-6 minutes. Just pop between a split bread roll and serve with some chips - or polenta fries if you're holding back on potato, too. Mushrooms are also a great source of B vitamins and also contain Vitamin D, which is great for us at this time of year when there's not that much sunlight around yet. Enjoy this much lighter version of burger night, if it takes your fancy. Heat the oil in a small frying pan and lower in the mushroom, dark side up. Let it sizzle slightly and then leave to cook for about 3 minutes. Throw in the garlic and the parsley and gently fry for another minute or two, just until the garlic becomes aromatic and softens a bit. Turn over the mushroom and cook for 2 minutes on the other side. Meanwhile, split the bread roll, arrange the greens over the bottom half and then top with the hot, garlicky mushroom. Top with the other half and eat.